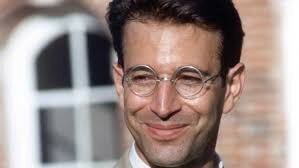 I’m lying in bed thinking about the late Wall Street Journal reporter, Daniel Pearl. Ever since the news about his beheading broke, I’ve been obsessed. What must it have been like for him to find out that all the charm in the world, all the charisma in the world, (which I do believe he possessed) had its limits? How did he feel the moment he realized that brainpower and affability no longer counted for anything? How did Daniel Pearl feel at the moment he knew he was going to die? I think you’ll be interested in this. It’s an article about Pakistan by a journalist named William Pesek. In the second paragraph he mentions his relationship to Daniel Pearl. He writes that he and Danny had worked together at the Wall Street Journal and that though they were close, it wasn’t the kind of friendship where they were attending each other’s birthday parties. They had bonded mostly over McClleland’s scotch and the music of this guy, Peter Himmelman. A lawn mower buzzes outside. I can hear our dog barking at the Fed Ex guy. My assistants are eating their lunches, laughing about something or other in the next room and I’m sitting in front of the computer reading this article over and over trying very hard not to cry. I write to Mr. Pesek and he writes back in less than 20 minutes. Hi Peter. It was an unexpected thrill to see your name in my e-mail box — I’ve been a fiercely loyal fan of yours for almost 20 years. Really — thanks for the note. I am based in Tokyo. As for Danny, everything you’ve read and heard about him is true — an extraordinary person and a huge loss to this world. As I mentioned in my article, my last time seeing him was in a Bombay bar and I’ll always cherish the memory. Danny and I met you very briefly in late 1995 when you played at the 9:30 Club in Washington DC. You graciously chatted with us for a few moments and even gave me a guitar string that had just busted. While Danny and I loved all of your work, we always agreed that “From Strength to Strength’’ is among THE best albums ever recorded … Danny also had a particular interest in your song “A Million Sides,’’ no doubt because he was a journalist. Again, Peter, thanks for the note and thanks for your interest in Danny. He’d be tickled to know you were asking for him. Now I know, (but for how long will I remember?) That assumption about one’s influence, one’s reach in the world, one’s power to affect change and to do good — are supremely difficult to gauge correctly. We strive to be good and to be humble, but because our tendency is often to underestimate our own abilities, we routinely conduct our lives on the basis of our assumed shortcomings — rather than upon our strengths. It is both odd and in truth, quite fair, for me to say that I love Danny Pearl. That I have a forged a relationship with a man, whom I’ve never known, never spent more than five or ten minutes with is admittedly very strange. But is it possible to say that an embodied spirit, such as the ones we each carry with us, can be connected in some fashion to a disembodied one? And if that’s possible — in some way — should it not be far easier to engage with love and truth with the living. Don’t look for empirical proofs about the validity of connecting with spirits. I haven’t, I don’t. I certainly haven’t with my ‘relationship’ to Danny Pearl, a man I still think about almost daily. And just as love among the living cannot be proven, or weighed — so too, our connections to those whom we experience only in our thoughts and memories — might be best kept apart from those same harsh measurements. Our goal as leaders (and who among us is not in some way a leader) might simply be described as: being of service, using our skills, our resources and our human-powers to elevate everything within our purview, at all times, and in all conditions. This, simple, elegant truth, I’ve learned from my ‘friendship’ with Daniel Pearl. Originally published at www.huffingtonpost.com on July 2, 2014.